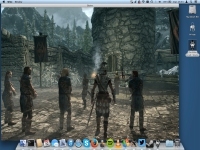 The Elder Scrolls V: Skyrim - Unterstützte Software - PlayOnLinux - Run your Windows applications on Linux easily! 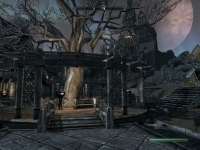 LA RENAISSANCE DU FANTASTIQUE Le nouveau chapitre très attendu de la saga Elder Scrolls nous arrive des créateurs du jeu de l'année 2006 et 2008, Bethesda Game Studios. Skyrim réinvente et révolutionne le monde ouvert, ramenant à la vie un monde complet que vous pourrez librement explorer. TITLE="The Elder Scrolls V: Skyrim"
POL_SetupWindow_check_cdrom "The Elder Scrolls V- Skyrim_disk1_0.sid"
Is there any way to play special edition on playonmac? I downloaded skyrim recently after the original version was taken off of the steam store so the only version I have is the special edition unfortunately & I do not possess the specs needed to run skyrim on my windows system as it's an old laptop.. Try creating a wineprefix using wine 3.10-staging and install xact on that wineprefix. Hello! I tried to install Skyrim on my Mac and every time I get stuck on same error! After downloading The Elder Scrolls V: Skyrim in PlayOnMac program I should open it and log in to my Steam account, but I can't do that because when I open it, it loading and then shows me that In program Steam.exe was found a serious problem (I'll attach details lower). I don't understand what I'm doing wrong and why it happenes, and I really need help!!! Please help me!!! P.S. I'll really belive in you my friends. -TITLE="The Elder Scrolls V: Skyrim"
-		POL_Debug_message "$(eval_gettext 'The game will fail to launch until you set /proc/sys/kernel/yama/ptrace_scope to 0')" "$TITLE"
-which pulseaudio && Set_OS "win7"
-POL_Shortcut "steam.exe" "$TITLE" "$TITLE.png" "steam://rungameid/$STEAM_ID" "Game;RolePlaying;"
-# POL_Shortcut "steam.exe" "Steam ($TITLE)" "" "" "Game;"
-	POL_SetupWindow_message "$(eval_gettext 'Please insert the game media into your disk drive')" "$TITLE"
-	POL_SetupWindow_check_cdrom "The Elder Scrolls V- Skyrim_disk1_0.sid"
-	#POL_SetupWindow_message "$(eval_gettext 'When $TITLE download by Steam is finished, do NOT click on Play.\n\nClose COMPLETELY the Steam interface, \nso that the installation script can continue.')" "$TITLE"
+ed exception: unimplemented function api-ms-win-core-sysinfo-l1-2-1..GetSystemTimePreciseAsFileTime called in 32-bit code (0x7b832214). ed exception: unimplemented function api-ms-win-core-sysinfo-l1-2-1..GetSystemTimePreciseAsFileTime called in 32-bit code (0x7b832214). I too am running into this exact issue. According to other threads, comments, and video I've found on YouTube, Steam is supposed to open at this point for me to download Skyrim. Steam does not open. Instead, I too am met with the error stating "The program Steam.exe has encountered a serious problem and needs to close. We are sorry for the inconvenience." If there is anyone out there who can shed some light on this issue and help us out, we'd be very appreciative. Skyrim doesn't install... could you help me? Recently switched back over to Arch and am currently having trouble installing Skyrim with POL. Whenever I try to run the installer the Steam setup window is too small and doesn't have anything in it if I try and force it larger. This prevents me from continueing on with the installation proccess. I think I am probably missing a dependency, but I don't know what. RAID:      No RAID data: /proc/mdstat missing-is md_mod kernel module loaded? 04/20/17 11:12:39 - [POL_Download_Resource] Warning: MD5 is missing ! I see that wine says something wrong with FreeType fonts, do you have installed this package? If yes, what version it is? 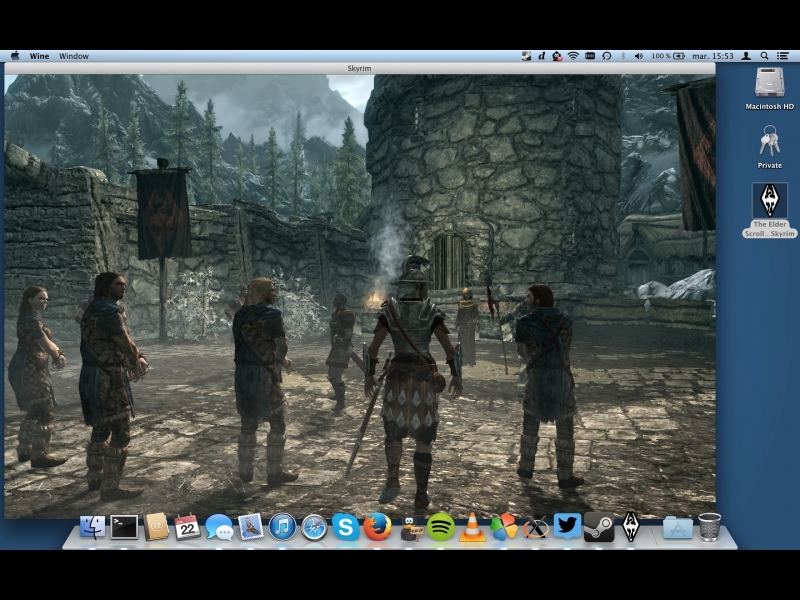 I've recently downloaded PlayOnMac so I can run Skyrim without using parallels - Skyrim runs pretty well, but I have no sound whatsoever while playing - no intro, no main menu music, no ingame sounds. Anybody got any tips on how to troubleshoot this? I haven't installed anything else or messed around with PlayOnMac, just Steam. +POL_SetupWindow_message "$(eval_gettext 'If you experience problems with shadows being glitchy, edit SkyrimPrefs.ini in ~/Documents/my games/skyrim directory and add bDeferredShadows=0 underneath the [Display] section.')" "$TITLE"
POL_SetupWindow_message "$(eval_gettext 'If you experience problems with shadows being glitchy, edit SkyrimPrefs.ini in ~/Documents/my games/skyrim directory and add bDeferredShadows=0 underneath the [Display] section.')" "$TITLE"
I've gotten Skyrim up and running, but when I try to close it freezes. I have it running in window mode because when I use full screen the freeze happens and I can't alt-tab to a new window to close skyrim. I've looked everywhere for a solution but was unable to find one. Can you help? I'm running Skyrim through play on linux with Wine 1.9.3. That's a common issue with Legendary Edition of Skyrim in Wine. As far as I know, it's a bug in the game engine and can't be easily fixed. This bug is due to Dawnguard being active. Is the Steam version of Skyrim working out-of-box using this installer? Could anyone please update the installer to use more recent version of Wine? Thanks! I found a fix for the movement bug, where your character continues moving after you stop pressing a directional button, and jumping while moving is screwy. By afterwards, I mean when you're done playing, of course. I have PlayonLinux and I have Steam off of that. I recently bought Skyrim and it opens to the main menu. But when I press play it freezes in the loading screen and I have to restart my computer. Any suggestions? I am currently dealing with a variation of the no sound issue on Ubuntu 15.10, but I am getting no sound whatsoever (no intro screen sound, no menu music, nothing). I checked via YouTube to make sure it was not a system wide issue, so it must be a wine issue. I have tried 1.9.3, 1.8, and 1.7. * to fix my issues and none of them seem to work. I have tried Windows XP and Windows 7 for most of these configurations and also tried switching between stereo and 5.1 Surround Sound. Does anyone have any other suggestions? EDIT: Figured it out! I have a pair of Astro A50's and I had digital output as my sound option. Switching to analog worked for me. I used the script I responded to below with everything default. 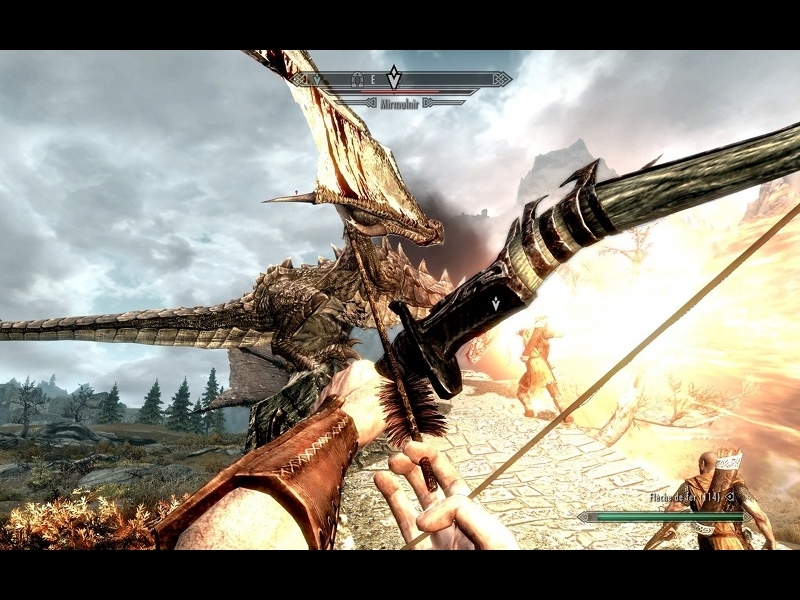 Skyrim is working great using POL, even with hundreds of mods. However I can't manage to get ENB working. I set the d3d9 library to native then builtin in the winecfg panel but then the game crash on startup (TESV.exe has stopped working). Is there any workaround to get ENB working on playonlinux ? Not sure if this is the best place to post this. I've recently bought Skyrim on Steam and currently trying to get it to run using POL. I've followed the installer and everything works great until I click play on the Skyrim Launcher. It launches the game and I can hear the sound of the Bethesda logo and the main menu music (even the noise of different menu options getting highlighted when I move the arrow keys) BUT there's no video shown with it--it's just a black screen. Any ideas about what's wrong? I've scoured the internet for the past two days and have had no luck. My guess is that it has something to do with video libraries not present, but I'm not sure what. I'm running Arch Linux 64bit and I've used Wine versions 1.7.36, 1.7.53-steam_crossoverhack, 1.8, and 1.9.2.
the Wine HQ page for Skyrim (linked above) lists some troubleshooting solutions including this: "Some mods change the fonts in Skyrim and sometimes that ends in wine not showing up the menu of Skyrim. Simple fix is to remove fontconfig.txt in Data/Interface." Might solve your issue. The installer is stuck on "Please wait while vcrun2008 sp1 x86 is installed"
Anybody have any advice or is this an issue with the installer that needs to be fixed? I have the same issue. The unofficial update version from 30.11 works however (on the third try for me actually). You could try to edit the latest script to the version 1.8 of wine. Hi, I have the same problem. How would I edit the latest script or otherwise fix it? Same issue here using latest mint and it's current POL version. Please fix the issue, currently unable to install. I ran into this same problem and found that if I altered the script to install steam after vcrun2008, dotnet35, and dxfullsetup then it didn't hang on vcrun2008 and installed correctly. I also updated to the latest wine version that is listed as Gold for Skyrim on Wine HQ (1.9.1), but that didn't seem to affect the vcrun2008 installation. Hi I have the same issue, sorry I am quite a noob with POL, so I dont understand how you managed to make it work, could someone who did it explain me ? Which script should I edit ? I updated the script to include the latest Gold Skyrim-supported wine version, and more importantly to fix this issue. To run it, open PlayOnLinux, go to Tools ---> Run A Local Script. Then browse to the script that you save, which can be anywhere. @decoyjim Works perfect for me, thank you for posting! I was nearly pulling my hair out trying to figure out how to fix this on my own :). I actually have been having sound issues now, but at least I have the game launching properly. No sound anywhere, but the game itself runs fine. More troubleshooting to do! @decoyjim i tried this but it stopped after wine part. si i cancelled and re-tried but now it doesnt get passed the virtual drive being created. I uninstalled and tried agin. but now i get a message saying to visit "playonlinux.com/en/topic-10534-Regarding_ptrace_scope_fatal_error.html" which doesnt work. it says "Package installation will fail until you set/proc/sys/kernel/yama/ptrace_scope to 0"
No Sound How do I fix this? Update to the latest Wine. 1.8-rc3 is out :-) . steam_crossoverhack is for https://bugs.winehq.org/show_bug.cgi?id=39403 ? I haven't run into it on .55.... Does it affect you on the latest? ??? ???? ?, ????????? ?? ????????! After the OS upgrade wine versions 1.7.33, 1.7.36 whatever settings I set (medium or high) textures go crazy. Before the upgrade it was OK on high. While running Skyrim on 1.7.51 wine it gets stuck on the downloading save picture while the sound shows I'm at the location already. Sorry if I don't write it in the correct place. It runs under 1.7.51 but on the lowest settings. Needs ntlmauth updated. But nothing worked up to now. Can somebody help me on this please? As I launched POL from command line, I looked if there is any output as soon as I clicked on "quit to desktop", but unfortunately, there is none at all, so no log for this. Can somebody please help me on this? Sound doesn't work correctly on ubuntu 15.04. Same here. I fixed it changing Windows Version from Win7 to WinXP and setting sound to Stereo in Wine configuration. I have found something very interesting. 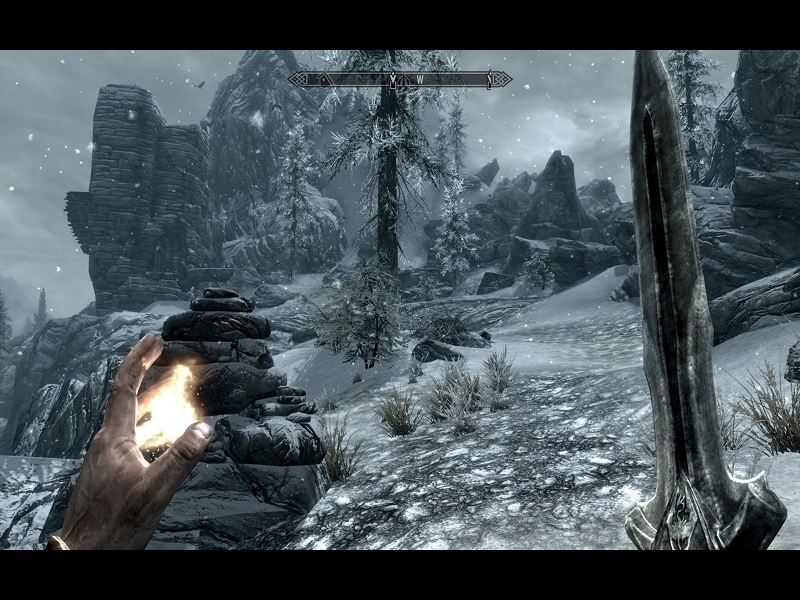 As it turns out, Skyrim runs very well with Wine 1.7.40-staging, a patched version of Wine. I have updated the script to use this. This Wine version (finally!) fixes the bug where you continuously walk in a single direction. It also does not have audio problems, unlike some newer, unpatched versions of Wine. 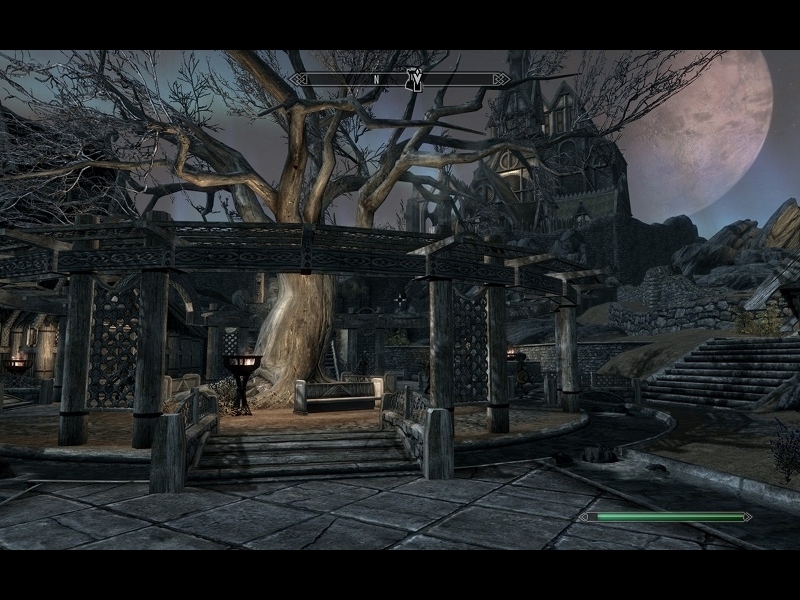 I've yet to find a problem of any kind when using Skyrim with Wine 1.7.40-staging; it runs flawlessly with this version. Thanks, this makes the sound work correct. I'm trying to install the non steam version. But when choosing CD-Rom it install steam anyway and asks for the steam product key. Can you post your debug log, please? Thanks for creating this installer, I've been pulling my hair out trying to get this to work under plain WINE for hours! The .NET 3.5 installer seemed to keep failing download, not sure why though as no error was generated and it then just inexplicably worked. Are there any other mirrors that could be used? During the install Skyrim step I selected to install from Steam, but couldn't because dwrite wasn't disabled at this stage. The installer continued regardless of course, at which point Steam was setup correctly and I could finish the process. Also, I have one suggestion, though this may apply to any Steam-based game installer, however I keep my Steam library on its own partition on my system, so before I could complete the "installation" (I already had it downloaded) I had to open winecfg to add a drive entry for the partition. It might be an idea to give users the option to do this from the installer; they'd still need to add the library within Steam, but it'd make things easier. Setting up in this way also means I don't need to keep a full copy of Skyrim + DLC + mods in the virtual drive, and can share it with Windows under emulation, or reboot and play natively, all with a single copy of the game. Since AAA games are only going to get bigger and bigger in future this would be a nice thing to have to avoid duplication. Anyway, thanks again for providing this! After hours of nearly getting Skyrim to work, this worked with only the minor hiccups during installation that I've already mentioned. The game now runs smoothly with no obvious issues so far! Does the DLC's for Skyrim work on this version? That will allow you to run the installer in that drive itself. If it doesn't work, I would check appdb.winehq.org first, our forums, and then maybe see if someone on gamersonlinux or a Skyrim players forum. If you cannot get it to work, or you find no information, make sure to try to file a bug with winehq so that, hopefully, someone can figure out a workaround if there is not one otherwise. does it work like a DLC? I don't know. Look where I said to and see if you find any information, if you tried it and it didnt't work. Does this fix the bug with the only graphics setting no matter what being low? I don't know. I don't play it, so I have no clue. Check it. Also does this let me play heart fire and the other DLCs for Skyrim? I have an issue with this game... the previous problem seems to be resolved but now I have an other...(gee happy me) when I press play, the game launches...only there is no Continue, charge previous game or any button for that matters... so I can random click on one of them but then it crashes... no doubt I have to change some stuff in the core files but what ? Although the walking bug that makes your character keep moving in a single direction has not (yet) been fixed, I habe found that you can get much better perofrmance using Wine 1.7.30. Before we change the script, maybe some of you can test Wine 1.7.30. I also think the walking bug might happen less frequently with Wine 1.7.30. I tried it and did not have any problems at all. For me, 1.5.31 gives me better performance than 1.7.3x. I have just ended the installation of the game on my Mac(Macbook pro Mid 2012, 2,3 ghz core i7, 8g RAM, SSD Drive). All the keys seems to react correctly but the animations are very slow. There is no difference between very low and very high quality. I tried to play Outline, but it's the same. I've ever play on this computer(directly on Win7) and I played on high quality without lags. I tried with the latest version of wine, but no difference. Can anybody help me to solve this problem? Nobody can help me? UP Please! It being faster with old versions was a bug in Wine that has been fixed in Wine 1.7.30 a few days ago. The mouse lags, not to mention if you walk, the key may get "stuck". Also, I have found a few grammatical errors in the PlayOnLinux installer, which I have fixed. -TITLE="The Elder Scrolls V : Skyrim"
+TITLE="The Elder Scrolls V: Skyrim"
-	#POL_SetupWindow_message "$(eval_gettext 'When $TITLE download by Steam is finished, do NOT click on Play.\n\nClose COMPLETELY the Steam interface, \nso that the installation script can continue')" "$TITLE"
+	#POL_SetupWindow_message "$(eval_gettext 'When $TITLE download by Steam is finished, do NOT click on Play.\n\nClose COMPLETELY the Steam interface, \nso that the installation script can continue.')" "$TITLE"
I think I found a bug which I don't know how to fix. Once Skyrim is installed, it will not have the Skyrim icon set up properly, but will display the PlayOnLinux icon. Yea I can confirm this icon problem. For me it also shows the POL icon instead of the Skyrim one. I downloaded PlayOnLinux after the traditional Wine installation was unsuccessful. My first issue was Skyrim's lack of audio, dialogue, subtitles, and inability to communicate with NPCs (and thus make ANY progress in the tutorial). Upon downloading PlayOnLinux I was able to make it past the tutorial, am able to hear sounds correctly, and communicate with NPCs. However, when travelling into any city, my character loses control and continues to sprint forward despite my best efforts to override this. No amount of button-smashing, clicking, and re-loading saves will help this issue. Whenever I enter any city, home, farm, my character just spams "W" (the move forward key) and won't recognize any other key as being pressed. I was wondering if anyone could provide support for my issue. If additional information is needed, please let me know. Can you try with wine 1.7.24? The problem has been for me a long time. The problem will help to save the game and re-loading. Same as wine 1.7.24 versions. My character loses control and continues to sprint (w, a, d or s key) and won't recognize any other key as being pressed. I am having the exact same problem. I'd be walking, then every 30 seconds the game acts like the key is stuck. It usually but not always happens with the W key. A little work-around to fix it until this is fixed is to press the Alt key a couple times when you lose control. Also, just a little warning to all of you, DO NOT use WIne 1.7.26. 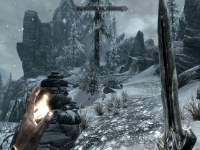 Although it may fix a few bugs in Skyrim, including one that makes you lose control when walking, it will cause Skyrim to give a C++ RUntime error when you attempt to close it. Just puttin' it out there. Skyrim is still crashing before the Skyrim flash screen appears (and there is no steam flash screen either). Can someone help? I am running Linux Mint Debian Edition - fully updated. And I installed the files necessary for WEEZY. I get a window from POL that says my program crashed. My computer is a Samsung gamer laptop: corei7, 16GB ram, nvidia GEforce GPU. 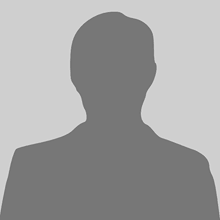 fixme:winsock:WSALookupServiceBeginW (0xd39d64c 0x00000ff0 0xd39d694) Stub! 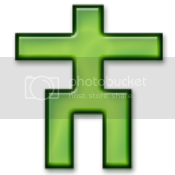 fixme:winsock:WSALookupServiceBeginW (0xd38d64c 0x00000ff0 0xd38d694) Stub! 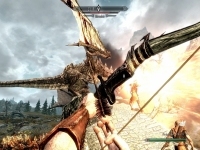 The Elder Scrolls V : Skyrim crashed. #POL_SetupWindow_message "$(eval_gettext 'When $TITLE download by Steam is finished, do NOT click on Play.\n\nClose COMPLETELY the Steam interface, \nso that the installation script can continue')" "$TITLE"
TITLE="The Elder Scrolls V : Skyrim"
POL_Shortcut "steam.exe" "Steam ($TITLE)" "" "" "Game;"
POL_SetupWindow_message "$(eval_gettext 'When $TITLE download by Steam is finished, do NOT click on Play.\n\nClose COMPLETELY the Steam interface, \nso that the installation script can continue')" "$TITLE"
Can you try with Wine 1.7.22? Comments : Running very nice. Steam not working anymore with 1.7.11 wine version it has no fonts.